As I’ve grown older and gained valuable experience in this life, there are certain things that I have come to appreciate. A couple of those things are Americanism and capitalism; both of which cultivate a no-nonsense, fun, and sometimes unique way of doing business. Enter the oil and gas industry. Excluding various jobs I held in high school, the landman life is all I have ever known. And to tell you the truth, that is perfectly fine by me. 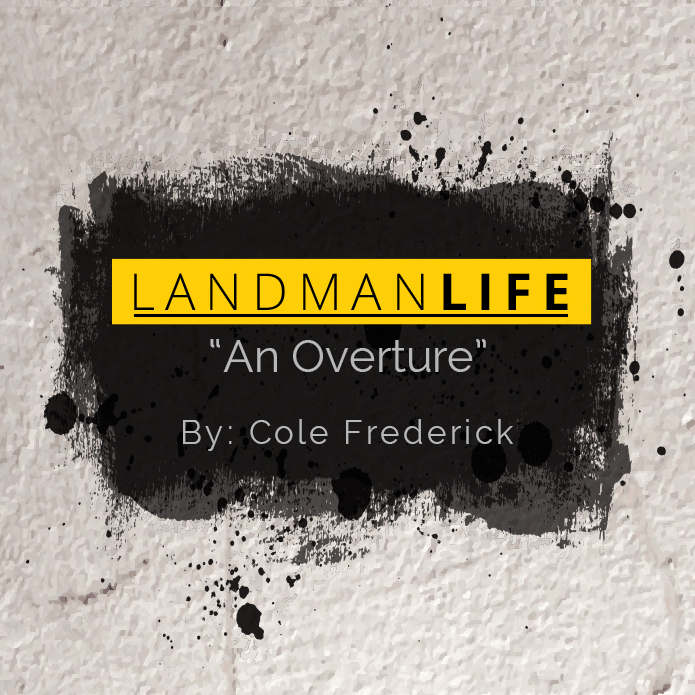 The landman occupation is a bit of an anomaly. I’ll talk with friends who work in other industries, and they will speak of the rigmarole of their day to day tasks, most of which constitute superfluous activities. They will talk about their required dress code and the cookie-cutter way to conduct themselves that is expected of upper management. I’m blessed to say that I have never really had to work in such an atmosphere. Oh, I’m sure that larger E&P companies have their fair share of bureaucracy that its employees must sift though. But the job of a contract landman is a different animal. I feel in many ways that the profession of a petroleum landman is essentially the last frontier of business in America- the Wild West so to speak. This can be partially attributed to the sense of individualism that being an independent contractor promotes. Sure, as a broker we have an overall idea of how a finished product needs to be presented, but the process up until that point, as long its done with competency and care, is largely done at the discretion of the landman. Many times, the landman will have to travel hours to a remote courthouse and stay in a motel, all the while being entrusted to get his or her particular assignment complete. When working in a remote county for an extended period, one must get creative when it comes to filling time. This could be by reading, hunting, working out, grilling food, etc. A lot of times, the county seat, no matter how small or remote, will have something distinct to only it, such as a lake or drive-in movie theater, providing for an additional option of something to do. It’s not unusual for landmen to befriend property owners whom they’ve leased, even to receive permission to hunt from time to time on ranches owned by lessors. The Wild West aura of the landman world can also give credit to the people this life seems to attract. Veterans, recent college grads, people coming over from completely different industries, and everybody in between help make up this eclectic workforce. On any given team, one may find a person who lived in urban areas all his life and another person who never lived in a town of more than a few thousand people. The dichotomy of the two individuals’ interaction is always interesting, and many times, funny to behold. Sure, when you get people together from all different parts of Texas (and some out-of-staters), you will not be without conflicts of views and opinions at times. But the good thing about the majority of the people in this line of work is that they see the big picture, understand the nature of our business, and ultimately respect their peers. As independent contractors, particularly at Peak, they are free to hold their own opinions and not worry about getting a call from HR. As clients push the boundaries on land plays and explore new areas, so too are landmen coming from near and far to complete the work necessary to give new exploration a chance at success. Really, considering the ups and downs of the oil and gas business, this industry as a whole requires one to possess a sense of bravado, not unlike those pioneers in the Old West, in order to push through and obtain any goals he might have. Truly, it doesn’t get more American than that.